Home Blog Software Voice technology; 4 reasons why the future looks brighter & louder! Voice technology; 4 reasons why the future looks brighter & louder! Voice technology is everywhere! Pretty soon it will be an unavoidable phenomenon, not just an app you never use. Voice technology is continuing to change the way we communicate in all aspects of our everyday lives. And, in recent years, an increasing number of high profile brands, including Microsoft and Apple, have recognised the many benefits that come hand in hand with voice technology. In fact, more people than ever before are embracing voice assistant devices at home and at work, increasing the worldwide demand for technology that can recognise human speech. Firstly, what is voice technology? 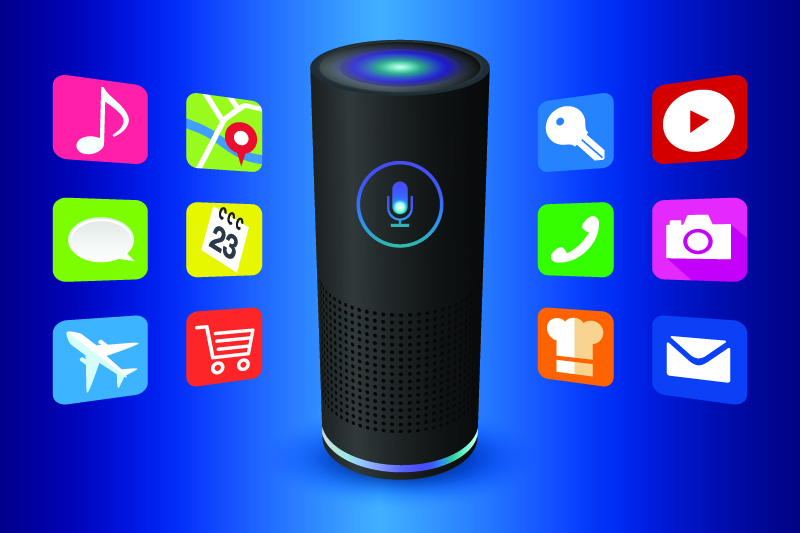 From the Apple HomePod and Google Home through to the Amazon Echo, brands have been quick to respond to consumer demand for voice assistants, which have been designed to integrate seamlessly into our everyday lives, ultimately changing consumer behaviour. If you own the latest smartphone or tablet, it’s very likely that voice recognition technology will already be on your radar, and it’s likely you will have already used it, in some shape or form. Whether you’re asking Cortana where the buy the best Flat White, ordering a birthday present from Alexa or asking Siri for the latest Twitter trends voice technology is here, and growing fast. Voice technology is a piece of computer software developed to decode the human voice. whether it’s Amazon’s Alexa, Apple’s Siri or Microsoft’s Cortana they all work on the same principle; listen, quantify and interpret. Once they have heard what you have said, your voice is translated into text which is in turn input as a command on your device. With this in mind, an increasing number of brands are now using it to allow consumers to actually operate their devices, respond to commands, and in some cases, write and translate messages. Think of voice technology as a vocal keyboard and mouse, but instead of typing in your questions/commands you’re saying them! 1. Where in the future are we going to find voice technology? 2017 saw an explosion of growth in voice recognition technology, and many conversational devices are now commonplace in homes and offices around the world, with a diverse range of sectors embracing this ground-breaking revolution. If you, like me, remember the early days of voice commands they were clunky, incoherent and often wouldn’t get what you said right. But user-experience got better and following product releases like; The Amazon Echo and Apple’s IOS 10/11 featuring Siri we finally got to a point where they became worth using! Voice technology has already proved to be extremely popular in a vast range of products, including smartphones, tablets and voice assistants. The main benefit of voice technology is that it’s entirely handsfree, so naturally, voice technology has been incorporated into products such as cars, furniture and even in the workplace, this allows full device functionality even when your hands are busy. However, many industry experts have stated that in order for voice technology to remain at the forefront of advances in tech, it’s vital that it is able to complement and enhance other emerging technologies. With this in mind, it will be the job of big names such as Apple, Amazon and Microsoft to ensure that they continue to create compelling, accurate and enjoyable user experiences with voice recognition technology that is in line and able to integrate with future innovations. Although many voice assistants already offer individualised experiences, it is predicted that they will become even better at differentiating between voices, with the ability to recognise and detect unique user voices. For example, customised voice detection suddenly allows users to obtain information that is unique to them! Their calendar, interests and individual needs/wants. We can see the consumer need for a more automated, easier user experience, recently released specialised, secure login software like Windows Hello and Apple ID have proven severely popular. Imagine if logging into your device could be done securely, handsfree and by just using your voice. Voice notifications are coming! And will be used to advise users about new content and features, in order to both encourage you to continue using your device and also following improvements to voice technology create a dialogue between device and user. Being able to dictate commands through conversation with your device rather than having to input anything manually. Voice technology has helpful and fantastic real-world applications, the mobility in how you can deploy voice technology is what makes it relevant, the only barrier to it, ultimately, is accuracy. The digital landscape is advancing all the time, with new technology continuously pushing boundaries and taking us to new places on a daily basis. However, one thing’s for sure, the future certainly looks bright for voice recognition technology! Watch this space! To find out more about the latest home technology available to lease with HardSoft, get in touch by clicking the link or call on 0207 1111 643 – our skilled and experienced team is always happy to help and can offer great advice on whats available!